The first South Gloucestershire Food and Drink Festival has been declared a stunning success after more than 20,000 people attended the event in Emersons Green. 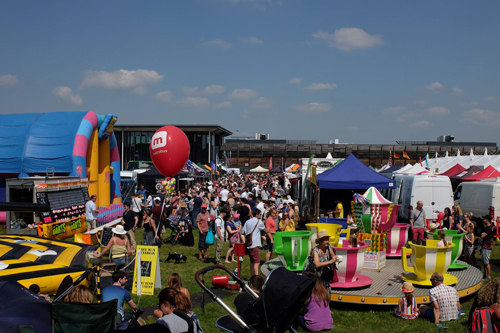 Over 100 exhibitors of food drink and crafts benefited from the sunny weather at the Bristol and Bath Science Park with 4,000 people attended the VIP preview night for local businesses and residents alone. Metrobus was on hand to show its new bus and was handing out timetables. The Science Park is one of the stops on the new service. Local bands Rock Choir, The Bad Dads & Richard Friend kept the crowds entertained and the royal wedding was screened live on the Saturday. Sarah Williams, one of the organisers said: “We wanted to encourage the community to come together to enjoy great weekend. We were really pleased with the number of people who came to the event and we’re already planning next year’s event”.